For those of you who went by Brig's Blog and read her discussion of Hi-Lift jack's, this won't be new turf. But I am responding because having a proper jack handy is important (as she points out). Rear of my FJ Cruiser this morning, note rear bumper assembly. Rear bumper swing-arm opens, revealing the Hi-Lift jack. Now the question is what do you attach the bite of the jack to without having it demolish your rig (a failing known to Hi-Lift jacks)? Note the rusty black part bolted to the bite of the Hi-Lift jack. not likely to slip off in standard jacking operations. The Hi-Lift doesn't work well in mud or in off-camber situations, so for those eventualities, I also carry an ARB Bushmaster X-Jack. 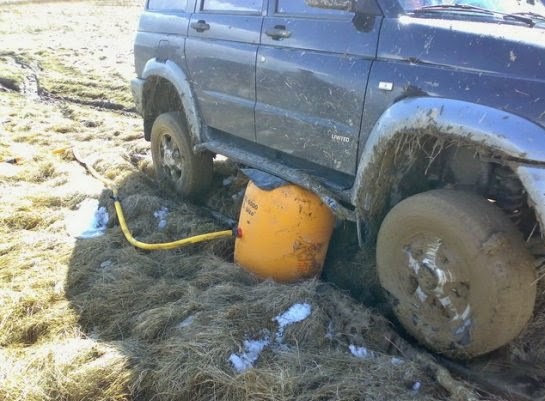 It can be inflated by using a compressor, a CO2 tank or directly from the vehicle's exhaust. 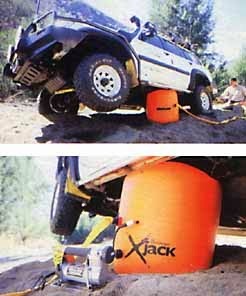 A Hi-Lift jack can also be used as a come-along (poor man's winch) and for a number of other and related applications such as stretching a fence. An X-Jack can't do that.